I'd recorded this material and released it on vinyl in 1980. I decided that it was worth re-releasing so that all of my recordings are available on CD. I've dedicated this CD to Dave Legassick who used to be a roadie for me in the early 70's. No drums or percussion were used and I've kept the arrangements simple. Very laid back stuff. 4. Black Room and the Candle. 11. Let Me Help You. I released this CD in 1998 this time using MIDI backing to give more of a band sound. Half the songs are about my daughter and the other half are about events that have happened to me including the trauma that the privatisation of the SECV has caused the Latrobe Valley. I've dedicated this CD to my daughter Amandah Rossiter. 1. Can't Take It Away. Released this CD in 2000 still using MIDI backing to fill the sound. It's a duo with my accomplice in music Mick Diamente. We each wrote 9 songs and played and arranged everything. This CD features a lot more lap slide than Eleven Bar Blues. 2. Don't Break My Heart Again. 4. Don't Wanna Hurt Again. 13. I Had A Dream. 15. Can't Trust A Woman. 17. Better To Have Loved. I had started working on this CD not long after 'Lonely Hearts' but became disillusioned with the music scene and just put it on the shelf. I have decided to finish off what I had started using newer techniques. Gone is the hardware and enter the relm of virtual recording on a PC. Very powerful stuff. I had started with Cubase but now use Sonar. Not sure if that's good or bad, but it does seem to work rather well. The CD features quite a few instrumentals. The songs go back a long way except for 'Holiday' and 'Window Shopping' which are relatively recent. This picture should explain what I was singing about in 'Bones'. 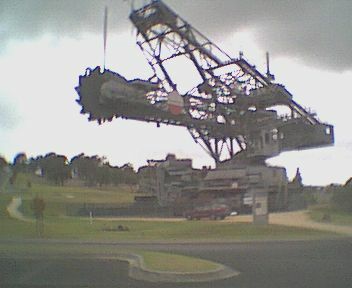 The dredger is located at the entrance to PowerWorks, a tourist centre. People on the Morwell Bypass travelling to Melbourne get a great view. It still reminds me of a dinosaur on display - sign of the times?